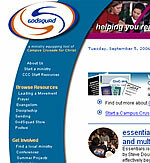 Last month I was working on a CSS Reboot of one of my sites, GodSquad.com. It is the only one of my sites that is still using tables for layout. A CSS Reboot is taking a HTML table based design and converting it into XHTML and CSS. Using CSS separates the content from the presentation. Using CSS has many advantages and I have long wanted to convert GodSquad over. The one sticking point is that one of the elements of my GodSquad design has presented some real challenges in converting in over to CSS. The has navigational elements that follow the shape of it. (See image on the left). Today, I decided to try again using a different CSS strategy. I decided to try to do some absolute positioning to solve some of the problems I was having with my first try. IE6 was giving too much margin or padding to the design and was messing up the curve on the navigational elements. As I tried the absolute positioning today, I was able to solve that problem. I have one other problem of difference in rendering in browsers that I need to solve but I am optimistic. I had “thrown in the towel” but now I am picking it up and giving it another try.